Community Animal Rescue Effort volunteers listen during Evanston’s Human Services Committee meeting Monday night. The shelter’s management and future operation were topics of discussion during the meeting. City officials moved Monday to issue a notice of lease termination to the current tenant of the Harley Clarke Mansion, moving closer to a resolution in the longstanding and heated debate about who should occupy the historic lakefront property moving forward. At a packed and tense meeting Monday night, Evanston’s Human Services Committee tackled two hot-button topics, both of which have elicited community outrage. In addition to discussing the future use of the Harley Clarke Mansion, committee members heard about 25 people speak on the future of the Evanston animal shelter. If City Council approves the committee’s recommendation, Evanston Art Center, the mansion’s current tenant, will have 240 days to evacuate the space. Prior to the committee’s decision, representatives from and supporters of the art center spoke in support of extending the time the center would have to find a new location. The center’s director, Norah Diedrich, requested that the nonprofit be allowed to stay in the building, located at 2603 Sheridan Road, for up to two years to allow for adequate time. Committee members ultimately denied the center’s request for additional time to vacate the space, standing by the lease’s original stipulation that the center have 240 days to evacuate following the termination of their lease. The committee also directed the city manager to continue discussions with the Illinois Department of Natural Resources, which introduced plans last month to use the mansion as a public coastal education center. The committee then sat through nearly two hours of public comment on the future of the Evanston animal shelter and the shelter’s current tenant, Community Animal Rescue Effort. 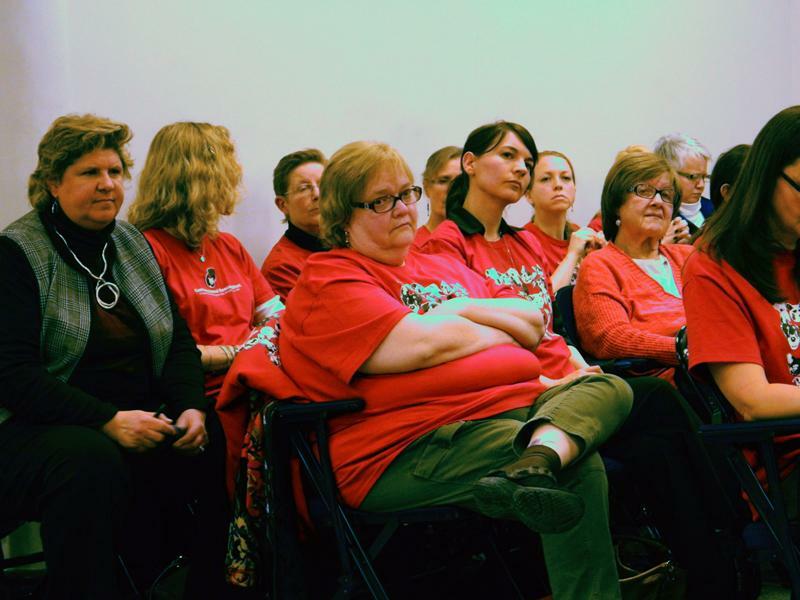 Representatives from CARE and those opposed to CARE’s current policies engaged in a heated and, at times, vitriolic debate about how the nonprofit handles dog adoptions and behavioral evaluations. Several CARE volunteers approached city officials in 2012 in protest of the nonprofit’s high euthanasia rate, which they claim is between 45 and 50 percent. After hearing just five of the 30 scheduled commenters, Ald. Jane Grover (7th) moved to form a subcommittee within Human Services to continue the discussion around CARE’s policies. Grover’s proposal passed unanimously. Alds. Judy Fiske (1st) and Mark Tendam (6th) will be the city officials on the committee. Although the committee had already acted on the issue, people continued to discuss CARE for the rest of the evening. The two opposing groups, composed of the center’s supporters, who all donned red CARE volunteer shirts, and people criticizing and questioning CARE, often clapped or cheered after a member of their group had spoken, and could be seen vigorously shaking their heads when an opposing speaker was at the podium. City manager Wally Bobkiewicz said the subcommittee will be comprised of three representatives from CARE and three critics of CARE, in addition to Fiske and Tendam. Bobkiewicz said the subcommittee will work to determine the future of the Evanston animal shelter and to create a renewed one-year lease between Evanston and CARE. Because the lease will be for 2014, he said he hopes the subcommittee will work quickly to resolve the issue.